I had this one in for repair recently, according to it’s owner it was bought second hand in the 1980’s and has never gone wrong, if only modern equipment was that well built! It had gone down on one channel and was brought in with it’s tuner which had no backlight to it’s display. The tuner was an easy place to start, apart from a tricky dismantling job the bulbs behind the display were easy enough to change. All five were gone and although the originals didn’t seem to be available I was able to get LED replacements. The amp took a bit more fault finding, luckily I was able to download a service manual from the internet and after a bit of investigation found one output transistor on the left channel short circuit. As should always be done the output transistors were replaced as a pair, along with the drivers which were directly couple to the outputs and although they measured ok I changed them anyway to be on the safe side. 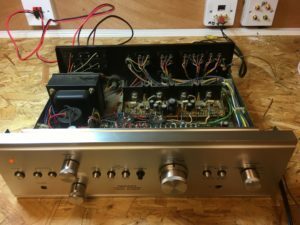 Once all the components were replaced the amp sprung into life giving a wonderful rich and warm tone from the Thorens turntable I was testing in the workshop. 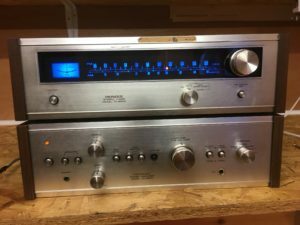 The tuner also performed well with it’s newly illuminated display, so a wonderful vintage system lives on, it would have been awful to have seen it dumped in a skip somewhere! Because of the nature of the fault I thought it best to return it to it’s owner in person, blown output transistors can often be caused by a faulty speaker so I took the opportunity to check them out properly before all my good work was undone. As it happened they were fine but at least I was able to make sure everything was connected up properly and demonstrate it to it’s very happy owner.